Aston Villa eased their relegation worries with a victory over Newcastle which takes them five points clear of the Premier League's bottom three. Following chances for Joey Barton and Nile Ranger, Villa scored against the run of play when James Collins headed in Ashley Young's free-kick. But that encouraged the hosts, who went close to doubling their lead through Gabriel Agbonlahor and Darren Bent. Newcastle offered little but Peter Lovenkrands' late header was saved. After a tame second half for the visitors, Lovenkrands also went close to levelling in stoppage time but his shot was stopped by Villa keeper Brad Friedel. Although the encounter was bathed in sunshine, the match failed to reach boiling point but that will be of little concern to Gerard Houllier's team, who took a huge step forward before they face crucial matches against their relegation rivals. Villa had plenty of opportunities to make the game safe after a shaky start and despite not reaching any great heights, they were resolute enough to take control of the game in the second half. On this evidence they will certainly face tougher tests, as a depleted Newcastle side seemed to bask in the relative security of being ninth in the table. Following Barton's comments about fellow England midfielders, where he claimed he was the best among them, BBC Radio 5 live co-commentator Graham Taylor said wryly: "I have to say that if Steven Gerrard or Frank Lampard were on the end of that I think they would have scored." Ranger also had a good chance for the visitors soon after but he chose to shoot when Lovenkrands was better placed. 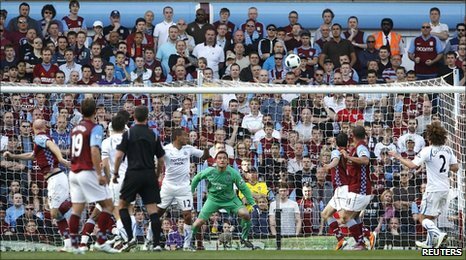 Then, against the run of play, Villa took the lead, with Barton involved as he brought Ashley Young down on Villa's left. Even though the temporary Newcastle skipper protested against the decision to referee Stuart Attwell, Young swung in the free-kick and Collins flicked his header past Steve Harper. The goal enraged Barton and he came close to being booked for arguing for a Young handball minutes later. The goal instilled confidence in the hosts, with Downing firing over on the half hour and the right midfielder providing a cross which Bent could not keep on target. Just before the break Villa were denied a second goal when Bent had the ball in the net, although he was ruled offside after Jean Makoun's clever pass. And Villa continued their growing momentum into the second period when Agbonlahor was put in huge swathes of space on the left by the returning Stiliyan Petrov, but Harper made a fine save to stop the striker's shot. Without the suspended Kevin Nolan and Cheik Tiote and the injured Leon Best, Newcastle were offering little in attack and Villa sensed an opportunity to settle their nerves with Young looking dangerous on the left. Despite further attempts by Agbonlahor and Young, however, they could not find the goal to reward their endeavour. It mattered little as Newcastle's challenge faded and Villa began to dominate the game in midfield, and it was only Barton's continued sense of injustice that offered the visitors any spark in a tame contest. Lovenkrands twice went closest to levelling matters late on but his header and then shot were comfortably saved by Friedel. And they will retire to reflect on next week's match against West Ham, content that they are heading in the right direction. 90:00+5:14 The referee blows his whistle to end the game. 90:00+3:06 Carlos Cuellar concedes a free kick for a foul on Fabricio Coloccini. Ryan Taylor fires a strike on goal direct from the free kick. 90:00+3:06 Booking Carlos Cuellar booked. 90:00+2:36 Shot from 12 yards from Peter Lovenkrands. Save made by Brad Friedel. 90:00+1:54 The assistant referee flags for offside against Darren Bent. Steve Harper takes the indirect free kick. 89:49 Booking Joey Barton is shown a yellow card. 88:26 Peter Lovenkrands takes a shot. Brad Friedel makes a save. 85:24 Substitution Robert Pires comes on in place of Gabriel Agbonlahor. 84:30 Corner taken by Joey Barton, save by Brad Friedel. 82:21 Unfair challenge on Peter Lovenkrands by Luke Young results in a free kick. The free kick is delivered right-footed by Ryan Taylor from right wing, clearance by Stiliyan Petrov. 82:21 Substitution Shefki Kuqi comes on in place of Nile Ranger. 80:32 Inswinging corner taken by Stewart Downing from the right by-line, clearance by Fabricio Coloccini. 79:01 Free kick awarded for an unfair challenge on Joey Barton by Stiliyan Petrov. Joey Barton restarts play with the free kick. 79:01 Booking Stiliyan Petrov is shown a yellow card for unsporting behaviour. 77:02 The referee blows for offside against Darren Bent. Steve Harper restarts play with the free kick. 77:02 Substitution Carlos Cuellar is brought on as a substitute for Kyle Walker. 75:10 Stiliyan Petrov is caught offside. Steve Harper takes the indirect free kick. 73:47 Corner taken by Ashley Young, James Collins takes a shot. Clearance by Joey Barton. 73:07 The ball is crossed by Ryan Taylor, James Collins makes a clearance. 72:50 The ball is delivered by Stewart Downing. 71:17 Jonas Gutierrez concedes a free kick for a foul on Kyle Walker. Direct free kick taken by Brad Friedel. 70:10 Corner from the left by-line taken by Ashley Young, Headed effort from inside the penalty area by Richard Dunne misses to the right of the target. 68:47 Ashley Young takes a inswinging corner. 66:47 Shot from outside the area by Stiliyan Petrov misses to the left of the target. 66:10 Substitution Nigel Reo-Coker joins the action as a substitute, replacing Jean Makoun. 65:42 Centre by Jonas Gutierrez, clearance made by James Collins. 63:56 Foul by Jean Makoun on Danny Guthrie, free kick awarded. Free kick taken by Joey Barton. 62:23 Substitution Ryan Taylor is brought on as a substitute for Steven Taylor. 61:16 Free kick awarded for an unfair challenge on Stiliyan Petrov by Fabricio Coloccini. Free kick taken by Richard Dunne. 60:01 Ashley Young crosses the ball, save made by Steve Harper. 58:17 Nile Ranger is ruled offside. Brad Friedel restarts play with the free kick. 57:59 Gabriel Agbonlahor takes a shot. Steve Harper makes a save. 54:51 Stiliyan Petrov fouled by Fabricio Coloccini, the ref awards a free kick. James Collins takes the direct free kick. 53:49 Ashley Young has an effort at goal from outside the box which goes wide left of the goal. 50:09 Shot on goal by Kyle Walker from long range goes harmlessly over the target. 49:36 Corner taken by Ashley Young, Steven Taylor makes a clearance. 48:37 Gabriel Agbonlahor takes a shot. Save by Steve Harper. 45:00+2:04 The ref blows to signal half-time. 44:36 The offside flag is raised against Darren Bent. Indirect free kick taken by Steve Harper. 43:20 Corner taken left-footed by Stewart Downing, Mike Williamson manages to make a clearance. 42:08 Inswinging corner taken by Joey Barton, Stiliyan Petrov makes a clearance. 41:58 Foul by James Collins on Peter Lovenkrands, free kick awarded. Joey Barton takes the free kick. 39:07 Free kick awarded for an unfair challenge on James Collins by Nile Ranger. Kyle Walker takes the direct free kick. 37:43 Unfair challenge on Joey Barton by Stiliyan Petrov results in a free kick. Joey Barton restarts play with the free kick. 36:58 Stewart Downing crosses the ball, Darren Bent has a header from close in and clears the crossbar. 35:12 The assistant referee flags for offside against Nile Ranger. Indirect free kick taken by Luke Young. 34:18 Unfair challenge on Jean Makoun by Danny Guthrie results in a free kick. James Collins restarts play with the free kick. 31:28 Shot by Ashley Young from 30 yards. Blocked by Steven Taylor. Outswinging corner taken by Ashley Young, Richard Dunne takes a shot. Clearance by Danny Simpson. 29:16 Effort by Stewart Downing from a long way out goes over the target. 28:56 Kyle Walker sends in a cross, Steven Taylor manages to make a clearance. 26:28 Unfair challenge on Mike Williamson by Gabriel Agbonlahor results in a free kick. Steve Harper restarts play with the free kick. 24:18 Peter Lovenkrands is caught offside. Brad Friedel takes the indirect free kick. 23:25 Ashley Young fouled by Joey Barton, the ref awards a free kick. The assist for the goal came from Ashley Young. 23:25 GOAL - James Collins:Aston Villa 1 - 0 Newcastle James Collins scores a headed goal from close in. Aston Villa 1-0 Newcastle. 22:04 Mike Williamson concedes a free kick for a foul on Gabriel Agbonlahor. Ashley Young restarts play with the free kick. 22:04 Booking Mike Williamson receives a yellow card for unsporting behaviour. 19:44 A cross is delivered by Jonas Gutierrez, save by Brad Friedel. 19:05 Nile Ranger takes a shot. Save made by Brad Friedel. 16:34 The ball is swung over by Luke Young. 14:23 Stiliyan Petrov challenges Nile Ranger unfairly and gives away a free kick. Free kick taken by Steve Harper. 13:20 Joey Barton has a headed effort from close in and clears the bar. 13:00 The ball is delivered by Jonas Gutierrez, clearance by Luke Young. 12:23 Corner taken left-footed by Stewart Downing to the near post, clearance made by Steven Taylor. 11:50 Danny Simpson sends in a cross, save made by Brad Friedel. 9:14 Jean Makoun fouled by Fabricio Coloccini, the ref awards a free kick. Free kick taken by Richard Dunne. 8:02 Unfair challenge on Richard Dunne by Nile Ranger results in a free kick. Direct free kick taken by Jean Makoun. 7:23 Nile Ranger takes a shot. Brad Friedel makes a save. Correction - 3:03 Stiliyan Petrov produces a drilled right-footed shot from 25 yards. Danny Guthrie gets a block in. 3:03 Shot by Stiliyan Petrov from 25 yards. Blocked by Danny Guthrie. 2:28 Corner from the left by-line taken by Ashley Young, save by Steve Harper. 1:17 Darren Bent fouled by Steven Taylor, the ref awards a free kick. Stewart Downing takes the free kick.